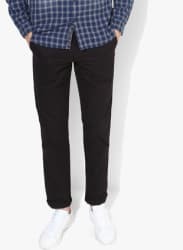 Spread your spark as your walk the streets wearing these black coloured chinos by U.S. Polo Assn.. These chinos features style and slim fit fit. Jump off a roof or slide down a hilltop to taste the thrill first-hand in these chinos team with t-shirt and shoes.